Now there is a classy Tardis plaid skirt for the Doctor Who fan that like to have a nice skirt that does not scream Doctor Who. The classy skirt is white with a blue plaid print and on it you can also find a tiny embroidered Tardis that has a Union Jack flag design. On the plaid print you can also find words and they say “Police Public Call Box” and that goes in rows all around it just like on the top of the Tardis. 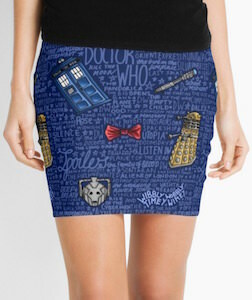 You can get this Doctor Who skirt in women’s junior sizes XSmall – 3XL and it is made from 97% cotton and 3% spandex. If you would like a Christmas skirt to wear to your Christmas party then how about this Doctor Who skirt? The blue skirt has a knit look and a fair isle design and on that, you can find the Tardis and two red Dalek on the bottom and above that a row with snowflakes and a Weeping Angel (click on the picture for a better view). 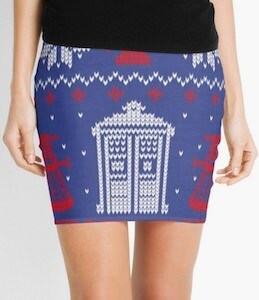 It’s just a fun Doctor Who skirt that is perfect for the holidays. And this Christmas skirt is available in women’s sizes XXSmall – 2XL and it has a stretch waistband so that it keeps fitting even after a big Christmas dinner. A true Doctor Who fan of course would like a Tardis skirt like this one as it makes you feel like you are part of the Tardis. The women’s pencil skirt shows the Tardis doors with the door signs and it even has the top “Police Public Call Box” sign on top even though you can’t see it on the picture. You can get this Doctor Who skirt in women’s sizes XXSmall – 2XL so that many true fans of the Doctor can enjoy wearing one. 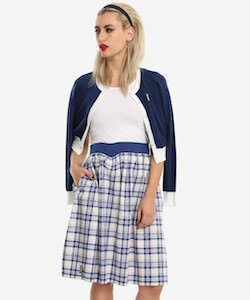 A skirt like this is great as everyday wear but would also work as part of a Doctor Who costume. If you want a Doctor Who skirt and really like the 11th Doctor then you are in luck as this skirt shows the Doctor of your choice with his famous Sonic Screwdriver. 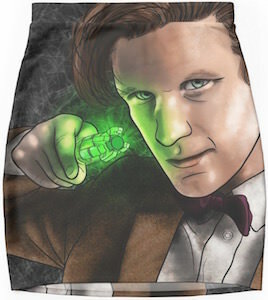 This is a women’s pencil skirt that comes in sizes XXSmall – 2XL and shows both on the front and back the same image of the Doctor. The skirt shows a portrait of the 11th Doctor and he is holding up his activated Sonic Screwdriver so that it gives off a green glow witch makes this Doctor Who skirt look even better. 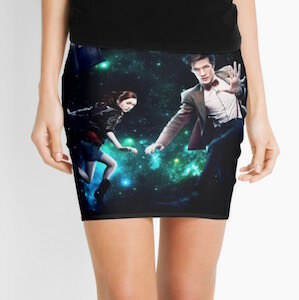 Now you can have your favorite Doctor with you all day long when you wear this skirt around town. 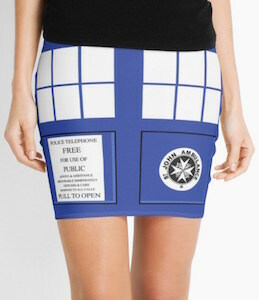 This Doctor Who skirt is just clearly something a true Doctor Who fan will enjoy. The skirt is dark blue and on the background you can see words lots of words that says things like Doctor Who, Spoilers, Rose, River Song and much more. And on top of all that text you can see things we all recognize from Doctor Who, there is the Tardis, Dalek, Cybermen, Bow tie, Sonic Screwdriver and even an Weeping Angel. You can get this fun women’s skirt in sizes XXSmall – 2XL and the skirt is made from 82% Polyester and 18% Elastane and has an elastic waistband for ultimate comfort. 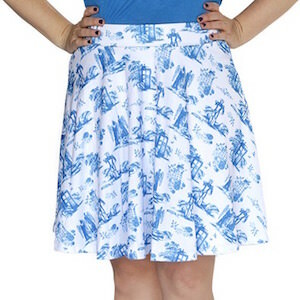 This Doctor Who circle skirt is perfect for you this summer as it is white with in a toile style blue print everything you expect from the Doctor’s adventures. On this women’s skirt you can find Dalek, Cybermen and of course the Tardis in a fun and classy pattern witch makes this skirt great for everyday and it does not matter if it’s just while hanging out with friends or going to the office this Doctor Who skirt is just what you need. You can get this Doctor Who toile skirt in women’s sizes Small – 5XL and all will look stunning so just pick up the size you need. 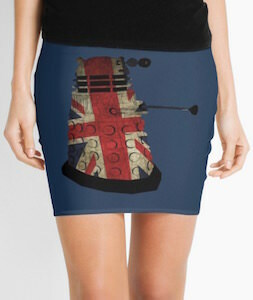 If you like Doctor Who and England then this Dalek skirt could be just what you need. On the blue pencil skirt you can find a big Dalek and it’s painted in the colors of the Union Jack flag and that makes it perfectly British. You can find the same Dalek design on both the front and back of this Doctor Who skirt. This Dalek skirt is available in women’s sizes XXSmall – 2XL and it has a stretch waistband for ultimate comfort and perfect fit. Sure not everyone can wear a Doctor Who skirt like this but I do believe that you could be the one that makes it really work. 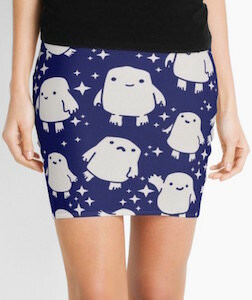 Now you can have an Adipose skirt that shows the little fat eating creatures at their best. This Doctor Who skirt is dark blu and shows white stars and many Adipose in different doing different poses like smiling and waving as they are a friendly little bunch that just needs to eat fat to grow. You can get this Doctor Who women’s pencil skirt in sizes XXSmall – 2XL and all are made from 82% Polyester and 18% Elastane and have an elastic waistband. Now you can show the world some Adipose creatures and most people will not have a clue what they are and that makes this Doctor Who skirt extra special and fun. If you are a true Doctor Who fan in need of a nice skirt specially made for a Doctor Who fan then this skirt is what you want. The black pencil skirt shows the galaxy with in it the Tardis, Amy and the Doctor just flying around. And this amazing image can be found on the front and back of this women’s skirt. You can get this Doctor Who skirt in women’s sizes XXSmall – 2XL and all have a elastic waistband and it’s made of 18% elastane and 82% polyester. So if you want a real special and amazing looking Doctor Who skirt then at least come take a closer look at this one.